�Movement� is based on three monumental structures created by Alexander Calder. The first movement called �Sailing� is based on La Grande Voile (The Big Sail) (1965) at MIT in Cambridge, MA. The second movement �Mobility� is based on Three Up, Three Down (1973) at High Museum of Art, in Atlanta, GA. The final movement is based on Flamingo (1974) at Federal Center Plaza in Chicago, IL. All three structures focus on animation and movement through space, and each musical piece is based on the aspects of moving music forward in representation of each structure. 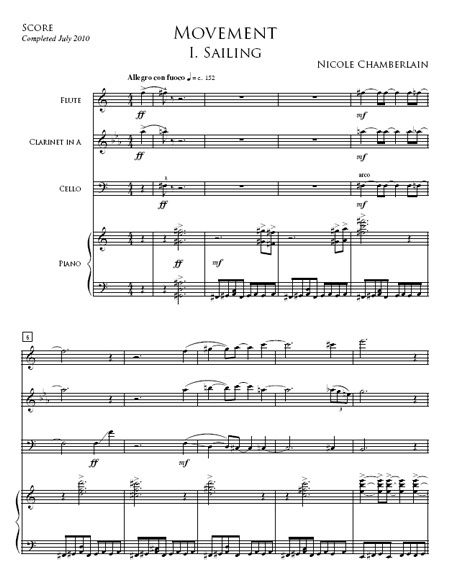 Score and parts will be delivered by email in PDF format.